So, that was rather exciting. The Cubs trailed all night, then Jorge Soler took over, Soler tied the game with a solo shot in the seventh inning, and extended the lead in the eighth with an absolute bomb, one of the farthest we have seen all year. Just pure excitement, this has been a long time coming, and finally we Cubs fans are being rewarded with talent on the field. It didn’t take Soler long to make an impact, he launched the fourth Major League pitch he saw 432 feet for his first career home run. Solid pitching? Check. Just enough hitting? Check. It seems simple, but the Cubs have played some solid baseball over the past 90 games (45-45 before tonight), and they aren’t showing any signs of slowing down with their latest win in Cincinnati tonight, their fourth straight. Travis Wood found his 2013 magic against his former employer, he worked six scoreless innings, giving up just two hits, while walking one, and striking out five. 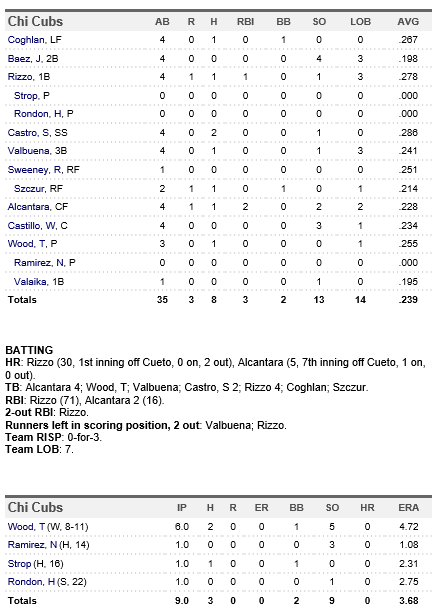 The Cubs pen shut, no, slammed the door once again, as Neil Ramirez, Pedro Strop, and Hector Rondon were lights out. Wood picked up his eighth win of the season, and Rondon registered his 22nd save of the year. Offensively the Cubs got started in the first, and that was all they needed. Anthony Rizzo hit an absolute bomb off of Cy Young candidate Johnny Cueto in the first, it was his 30th home run of the season, that’s impressive. Starlin Castro returned from the bereavement list tonight, and picked up right where he left off, he went 2-for-4 in the win. Arismendy Alcantara joined the fun late, as he blasted a two-run shot to give the Cubs some insurance in the seventh. Get ready for Jorge Soler, he debuts tomorrow! Note: Anthony Rizzo left the game late with some back tightness, he should be fine. Not a bad way to go out, eh? Jorge Soler took Taijuan Walker deep last night, then was pulled because he was getting called up by the Cubs, solid night. Pure power on display here, gets a fastball up, and destroys it, I can’t wait for Wednesday when Soler is expected to make his debut with the Cubs in Cinicnnati. Finally. 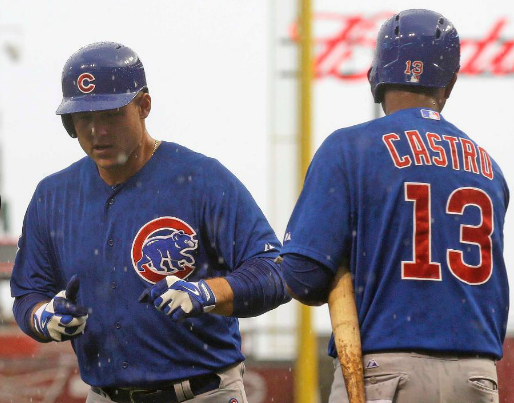 Per David Kaplan, Jorge Soler will be called up by the Cubs, and will be joining the big club in Cincinnati tomorrow. Soler hit his eighth home run (with Iowa) of the season tonight, off of Mariners number one prospect Taijuan Walker… then was pulled from the game, now we know why. Welcome to Chicago, Jorge! The one thing fans will notice with Soler is the advanced approach, he knows how to work his at bats, and will take his walks, a stark departure from what we have seen from Baez, etc. It was an exciting day for the prospects yesterday, and Addison Russell made sure to join the fun. Russell belted his 12th home run of the season with the Smokies (175 at bats), after a slow start, Russell has dominated Double-A pitching. There was no doubt about this one as it left the stadium in left field. The blast was Soler’s 7th with Iowa, and 14th on the season, not too bad conisdering he’s only had 198 at bats. Enjoy.